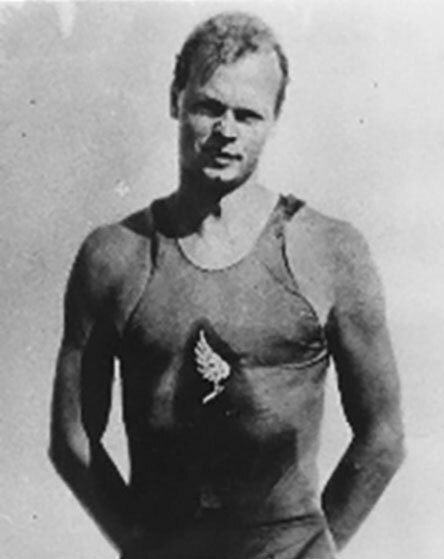 When Charles Meldrum Daniels moved to Buffalo in 1909 from New York City, he brought with him worldwide notoriety as a championship swimmer. In the 1904 Olympic Games, Daniels swam his way to gold medals in the 220 yard freestyle, the 440 yard freestyle and the 4×50 yard freestyle relay. He also captured the silver medal in the 100 yard freestyle, and a bronze medal in the 50 yard freestyle. At the 1908 Olympic Games in London, Daniels won the gold medal in the 100 meter freestyle, and the bronze medal in the 4×200 meter freestyle. Daniels also won gold in the 100 meter freestyle at the 1906 Intercalated Games in Athens, Greece. This competition is also known as the 1906 Summer Olympics, however medals won are not officially recognized by the International Olympic Committee. A world-wide phenomenon, Daniels set 14 world records during a four-day period in 1905, and at that time he held every world freestyle record from 25 yards to one mile. He also set seven world records of various distances between 1907 and 1911 in three countries. From 1904 until he retired in 1911, he won Amateur Athletic Union Championships 31 times and was generally considered to be the world’s greatest swimmer. Daniels is credited with inventing the American Crawl by introducing a modification of the Australian Crawl to use the whole leg and six kicks for every two-arm cycle. His new style became the predominant form for freestyle swimming. Daniels was widely recognized for his excellence in the pool. He was named North American Athlete of the Year for 1909 by the Helms Hall Athletic Board and has been inducted into the International Swimming Hall of Fame (1965), the Metropolitan Swimming Hall of Fame (2000) and the U.S. Olympic Hall of Fame (1988). In addition to his swimming prowess, Daniels was a squash and bridge champion at the New York Athletic Club and after retirement was a top ranked amateur golfer. Daniels lived in Buffalo until 1953, passed away in Carmel, CA in 1973, and is buried in Forest Lawn Cemetery.